Chromecast is Google's Wi-Fi media streaming device that plugs into the HDMI port on your TV. It requires an initial setup and then you’re ready to go. If you’re traveling to several places during your vacation or business trip, you’ll have to run that initial setup in each location, because the Wi-Fi network that’ll be available will be a different one. 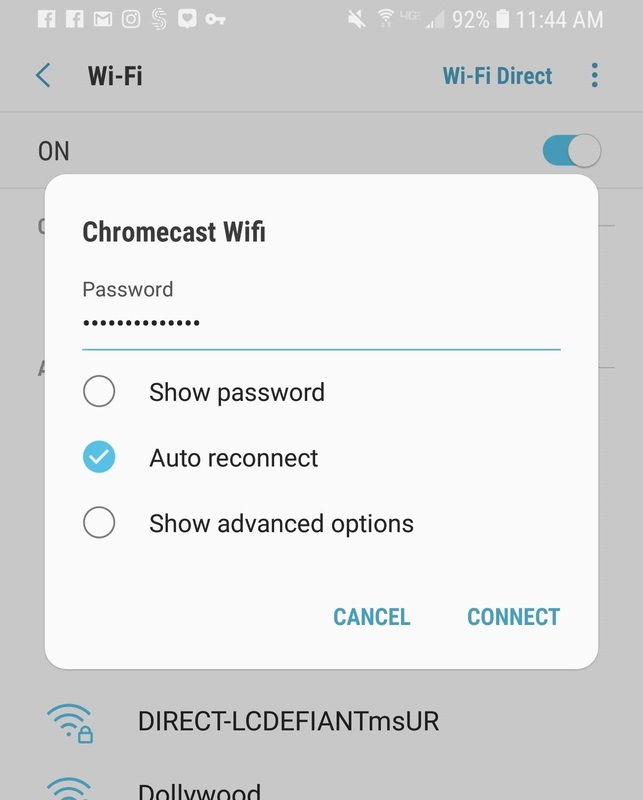 Connectify Hotspot helps you connect and save time by acting as the “middle man” between any type of Internet connection and your Chromecast device, so you only have to run the setup once to be able to do it anywhere. The Google Home app can get confused if it's running on the computer that's running Connectify Hotspot, so you'll have to use your phone or tablet to run their setup utility. The original Version 1.0 of the Chromecast device does not support 5 GHz Wi-Fi. If Connectify Hotspot is used to share a Wi-Fi network which runs on 5 GHz, then Hotspot shifts to 5 GHz itself. 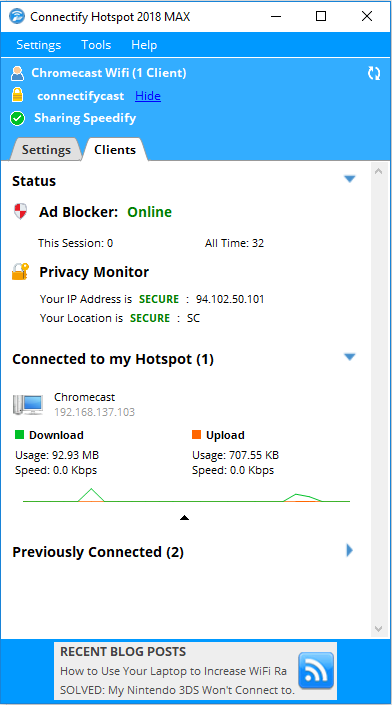 The Hotspot user interface will show a warning, and the Chromecast will not be able to find the network. In all other cases, however, Hotspot will use 2.4 GHz and will work perfectly with the Chromecast. Step 1. Create a Wi-Fi hotspot with Connectify. Click here to see a video tutorial on that. Step 2. Join the Wi-Fi hotspot you just created with your phone or tablet. Step 3. 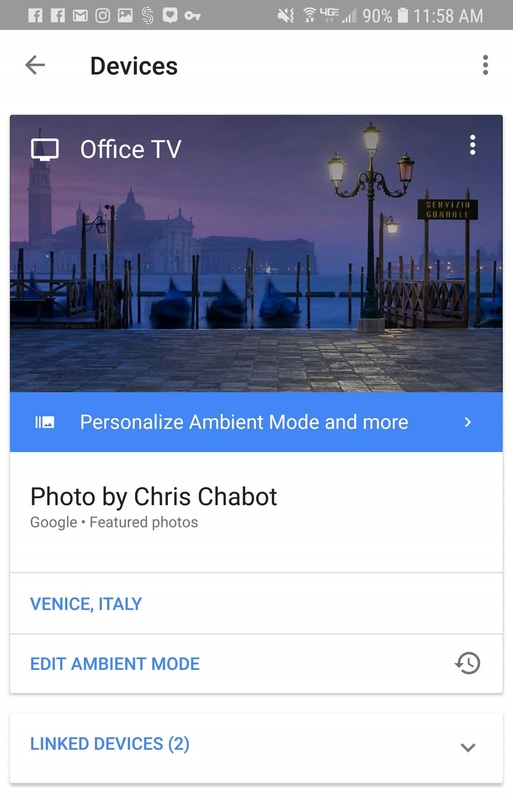 Connect your Chromecast to the TV and use your phone or tablet to run the Google Home setup utility. Step 4. Follow all the prompts until you get to the WiFi setup screen. Step 5. Select your Wi-Fi Hotspot as your network, enter the password and then click the 'Set Network' button. Step 6. 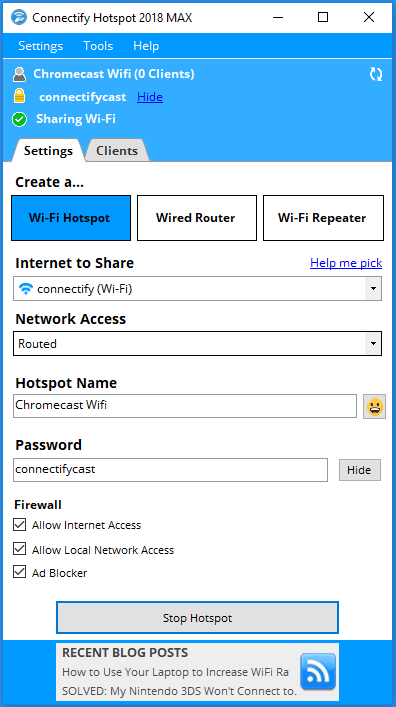 Your Chromecast should now be connected to Hotspot and you should be ready to cast! Remember - these steps only have to be done once (you can do that at home, before leaving) if you don’t change the hotspot’s name. Then - at the hotel - just plug the Chromecast into the TV, start the Hotspot by connecting to the available Wi-Fi network and you should be ready to use Chromecast. Note: One customer has reported that the Chromecast can get stuck so that it does not see the Connectify Hotspot. They reported that resetting the Chromecast made it work again. What does my Connectify Hotspot 2018 PRO/MAX license include?